The Youth’s Temperance Lecturer was a book written by Charles Jewett (1807-1879), a prolific Bostonian author in favor of the Temperance Movement. This book was published in Boston by Whipple & Damrell, a company that was heavily involved in the printing of Temperance and other reform literature. The preface of this lecturer establishes Mr. Jewett’s purpose and expectations for his book. He wrote it in order to fill a perceived deficiency in the libraries of educators regarding temperance issues, and wrote to the young people in order to educate them more fully regarding the dangers and pitfalls of intemperance. He wrote, in this preface, that he did not expect a warm welcome to his book, especially among those whose livelihood would be harmed by it (i.e. the distillers, taverns, and others directly involved in selling and making alcoholic beverages). He defends himself by saying if his words have a poor influence on youths, then the book itself will die, but if it has a positive influence, then those young people and their parents will ensure the printing. The rest of the excerpts tell the tragic story of a father who, in a drunken rage, killed his baby boy, and relates the misery and terror felt by him after becoming sober while being held in jail. 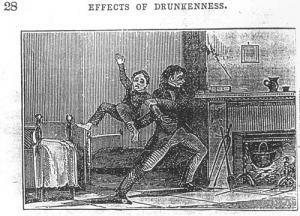 Mr. Jewett uses this story to remind his readers that they can be held accountable for their actions, even if those actions were a result of drunkenness. The object which I have kept constantly in view while preparing this work for publication, has been to convey to the mind of the youthful reader as much truth, in relation to the causes and consequences of Intemperance, as is possible in so few pages. I have long been impressed with the belief that something of the kind was needed to supply a deficiency in the Sabbath school library, as well as in the private libraries of parents and such as are entrusted with the education of youth. That all, into whose hands the books may fall, will be pleased with its contents, is more than I expect. I anticipate for it rather a cool reception from the sellers of intoxicating drinks, as well as from distiller, brewers, &c. If it should be condemned by many of the charges of ultraism, I should not be surprised; but to such I would seriously put one question not whether the principles it inculcates may agree with their practice, but whether they believe it calculated to exert on the minds of youth an injurious or a salutary influence? That is the test by which it should be tried. If it is calculated to exert a pernicious influence, or even a negative one, it can have no claim to the favor of any class in community; for there is quite enough of error and unmeaning trash now in the market, in the shape of books for children. But if, on the contrary, its tendency to be to guard youth against the seductive influence of dangerous and vicious habits, I feel confident the work will commend itself to the judgement and patronage of an intelligent public. I would take this opportunity to express by indebtedness to an esteemed friend for a number of the poetical sketches contained in the work. This, little reader, is not fancy sketch, but a representation of what actually took place in the town of Foster, Rhode Island. A poor drunkard went home to his family one day from the grog-shop in a great rage, and began to beat his wife, who fled from the house, leaving her little boy behind her. She did not once think of his hurting the child, who he loved very dearly when he was sober. But being maddened by the poison he had drunk, and not knowing what he was doing, he caught up the poor boy and dashed his head against the jambs of the fireplace. The alarm was raised, and the neighbors ran in, but too late to save the child. It was so badly bruised that it lived but a short time. When the poor wretch was brought before the court to answer for the crime, one of the neighbors brought in, folded in a piece of paper, a lock of the boys hair, with skin attached to it. The man had picked it off the jamb to which it had been fastened by the blood of the poor little victim. Before the child was buried, the father was permitted by his keeper to see it, and a gentleman who was present at the time, told me he never saw a person in such agony as was that wretched man. He had become sober; his senses had returned, and he realized what he had done, and he bowed down his face upon the cold and discolored head of his little boy and mourned and wept as though his heart would break. How do you think the hard-hearted rum-seller, who poured out the poison to the poor man, would have felt, if he had witnessed the scene? The largest number by far of those wretched men and women who are now shut up in the jails and prisons in different parts of the country, would never have committed the crime of which they have been guilty, had they never allowed themselves to use strong drinks. And remember, little reader, that if you swallow these poisonous drinks, you cannot tell what you may be left to do, or what you may be made to suffer in consequence. His rage know no control. How was is sad heart wrung! That poured to him the cup?